Solus is the UK’s leading supplier of Garden, Leisure and Home Décor products that has been in business for over 30 years. With several large offices in the UK, Solus are the main supplier of key brands to many garden and leisure retailers across the UK and overseas. Solus required a Digital Signage system at their corporate head office to communicate more efficiently with staff about sales figures and general corporate information. They also required the ability to stream live news onto the screens as well as display in the latest industry news to keep the staff informed of events that could influence their business. Eclipse Digital installed a ONELAN publisher that included a TV card. This publisher supplies content to a ceiling mounted 60″ screen in their corporate head office. 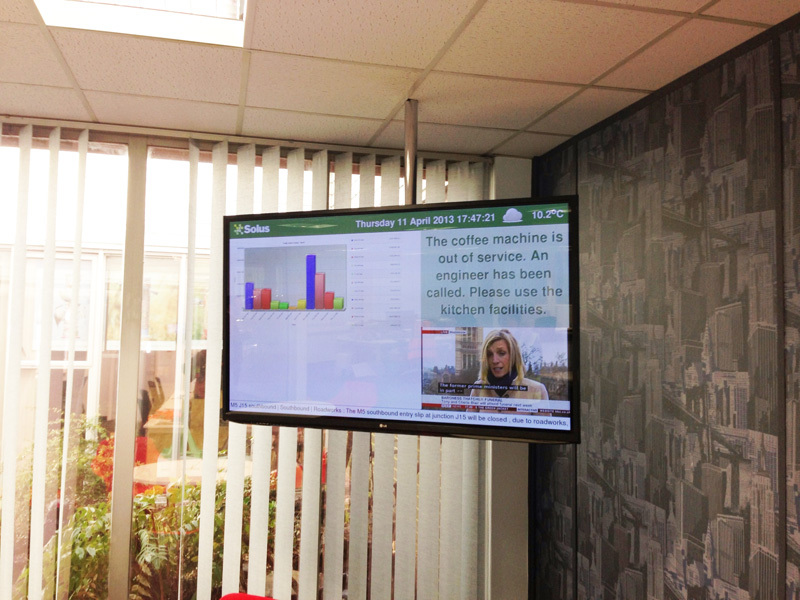 The digital signage content pulls in live RSS feed information from a leading gardening industry website, live BBC News and local weather information to keep the staff updated about influences that could have an effect on their business. There is another zone that is specifically for corporate information and in the main zone, live sales data is displayed in graphical format to show the staff how they are performing in real time.